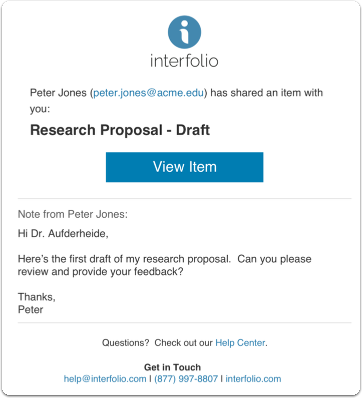 This Interfolio Dossier feature allows users to collect feedback on academic materials and plans for self-presentation of your academic work, research, creative production, teaching, and service to the academic community. Comments are restricted to be viewed only between the document owner and also the owner of said comment. You cannot have commenters collaborate. 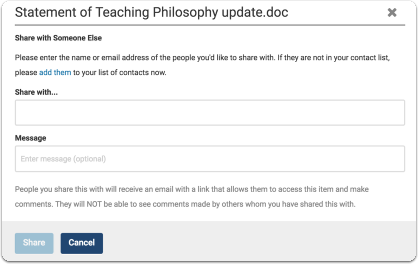 If you want to receive feedback on a new version of a document, you must upload it and share that new document with the reviewer. Users do not need an Interfolio account to review a document. If the reviewer/commenter does not have an Interfolio account, they must login via the link provided in their email. Updating a document (such as a Non-Confidential Letter of Recommendation or a CV) will remove all previous feedback on the old version of the document. Why can't I comment on a document? This section is only relevant for users who have paid for their Dossier Deliver account to request, manage, and send their materials and confidential letters. If you are a Dossier institution user see the section below. With an active Dossier Deliver account, you can share your Dossier materials (with the exception of the letter of recommendation) and your collections of materials with anyone regardless of whether that person has an Interfolio account. This section is only relevant for users who have had their account provided directly by an Interfolio client institution. If you are a Dossier Deliver user who paid for their personal account see the section above. 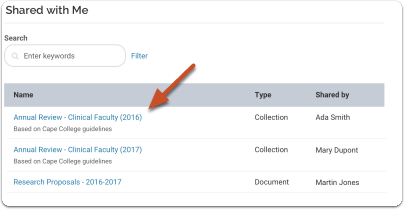 With your Dossier Institution account you can share individual items and collections of materials stored in your Dossier with other Dossier Institution users at your institution. 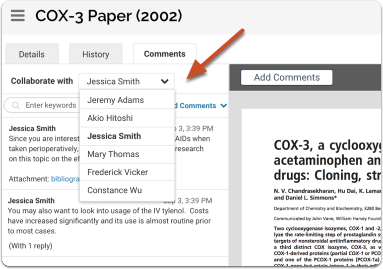 The person you share with will be able to view those materials online through their browser, within an Interfolio environment, and write comments on them. In order to access the shared document/collection, current Interfolio users will have to sign into their own Dossier account. You can hold an account of both user types: by having a Dossier Institution AND a Dossier Deliver account. 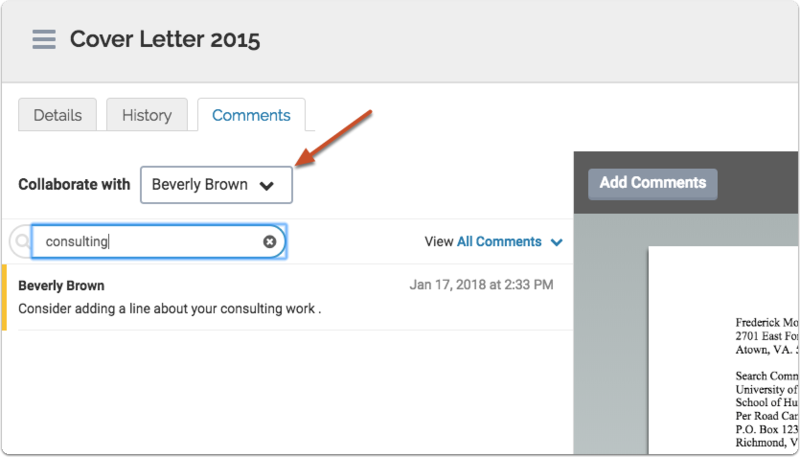 Add the emails of the person or persons from your list of contacts with whom you want to share the item from your Dossier, enter a message if necessary, and click "Share"
Note that you will need to have the person in your contact list. You can easily add them from here by clicking "Add Them." For more information on adding contacts see How to: Create Your List of Contacts and Send Letter Requests to Multiple Writers. 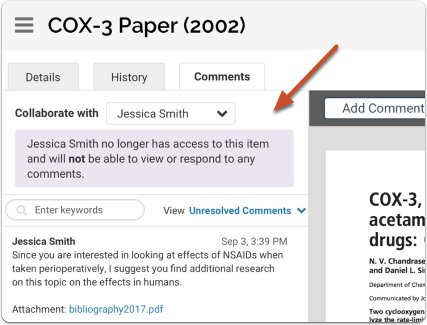 Document owners have the option to include a message that will appear in the email notifying the reviewer/collaborator and giving them access to the shared materials. 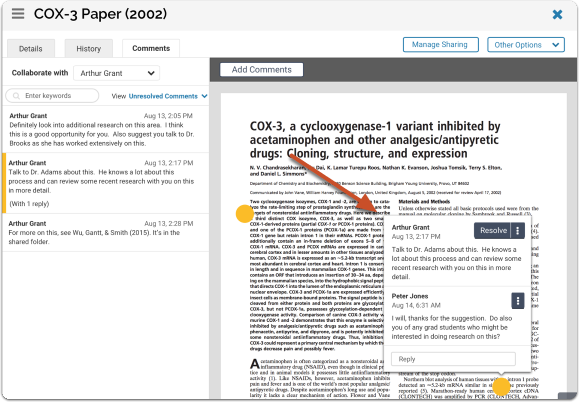 When sharing with multiple people, reviewers will NOT be able to see the comments made by others with whom the document owner have shared the item. In the image above, the account is using a Dossier Deliver profile. Dossier Institution users may only search for users within their institution. If reviewers cannot find the email, they should check their spam filter. This from the email links directly opens to the shared item. 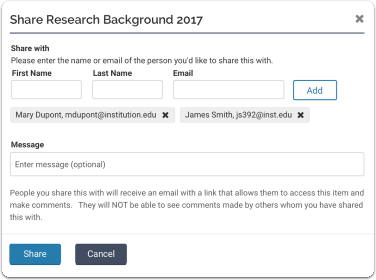 If the reviewer/collaborator are not logged in to their Interfolio Dossier account, the only way they can access the item or collection is through the link included in the notification email. 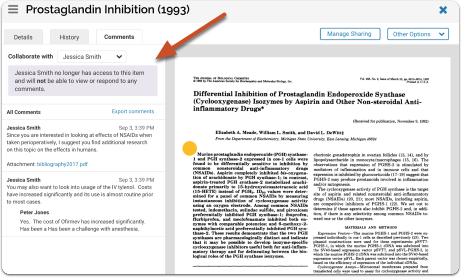 Recipient view: If the reviewer/collaborator shared the item has an active Dossier account, the shared item will also appear on the "Shared with Me" tab from the navigation bar. The table will display all documents shared with you. 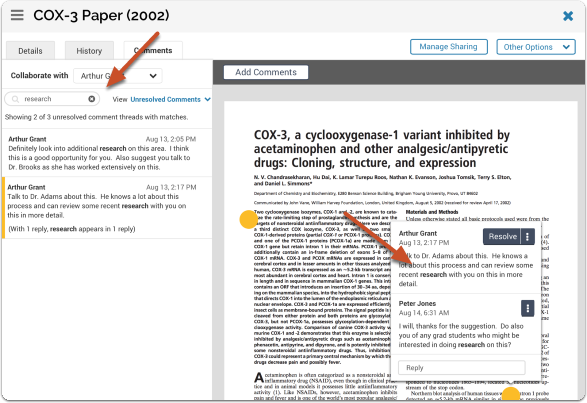 The reviewer/collaborator can leave comments with feedback on the shared material for the document owner to view. 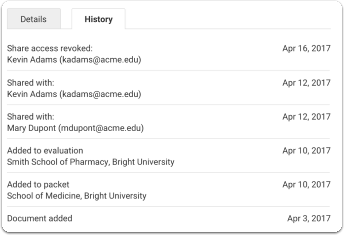 In the example below, the user has searched for "research." The list of results displays in bold text in the list of comments, and in the comments as they appear on the document. 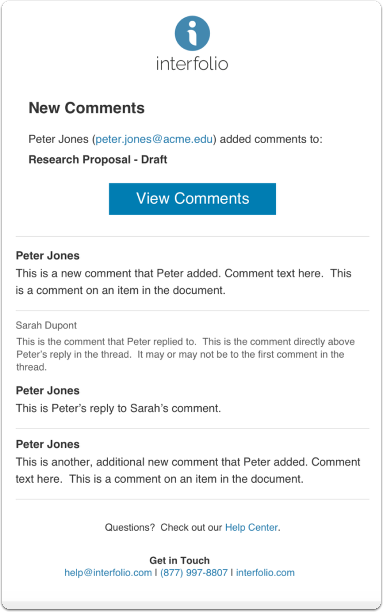 If the document owner has shared with multiple collaborators, they can only view and respond to the comments of one reviewer at a time, and all threads are restricted to both reviewers. 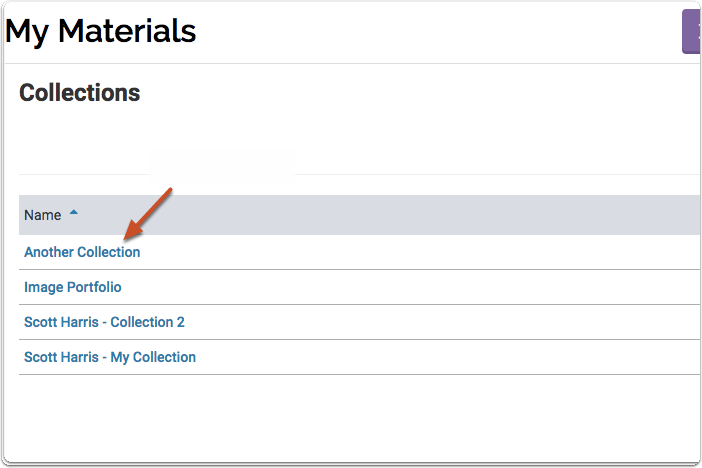 Document owners can switch between collaborators from the dropdown list labeled "Collaborate with..."
Collections of materials can be shared from the Collections tab of your Materials page. You can also share a collection of materials from the home page of the collection. 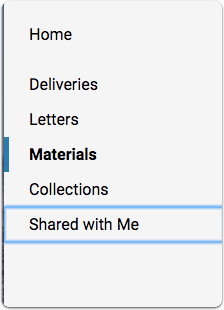 Sharing collections of materials works the same as sharing individual items from your Dossier. Enter the name and emails of the people you want to share with. 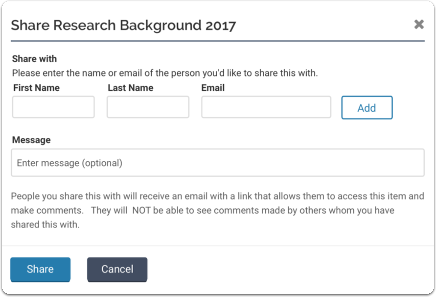 You have the option to include a message to the person that will appear in the email notifying them and giving them access to the shared materials. 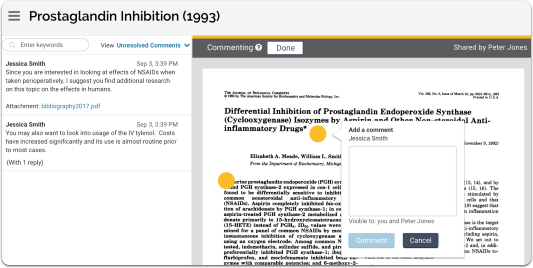 Note: When sharing collections with multiple people, reviewers will NOT be able to see the comments made by others with whom you have shared the items within the collection. Each person listed will receive an email with a link that allows them to view the collection. The link in the above email opens the collection. If the person with whom you have shared the collection does not have an account, or are not logged in to their Interfolio Dossier account, the only way they can access the collection is through the link included in the notification email. 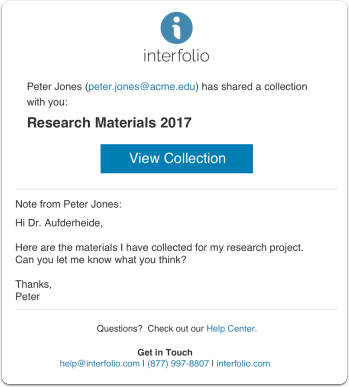 If the person with whom you share the collection does not have an Interfolio account, the link in the email will take them to a page that looks like the one below, where they can choose items to review from the list of materials in the collection. For more information on the collaborator experience, click here. 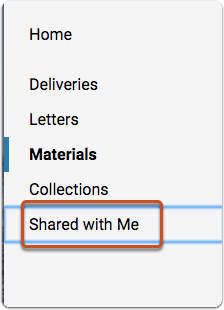 Document owners can manage their shared materials, including revoking access to individual items and collections and sharing their materials with others by adding to the list of collaborators. This button will only appear on items that are shared. Otherwise, the "Share" button, will appear here. 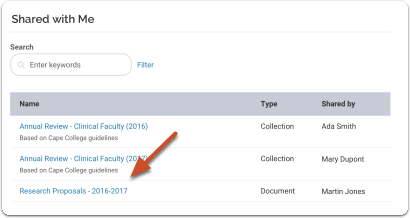 This will be noted when you open the "Manage Sharing" window, and will include a link to the shared collection. Comments made can only be viewed by the reviewer and the commenter. 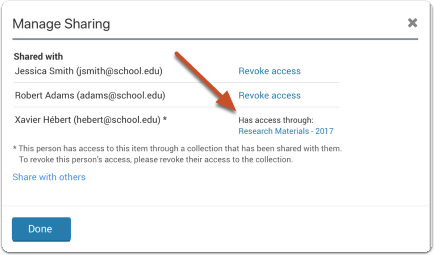 When a user has been invited to review and provide feedback on a scholar's materials, they will receive an email as displayed below. Users that do not have an Interfolio account should either bookmark the link or save the received email to be able to navigate back to the document easily. 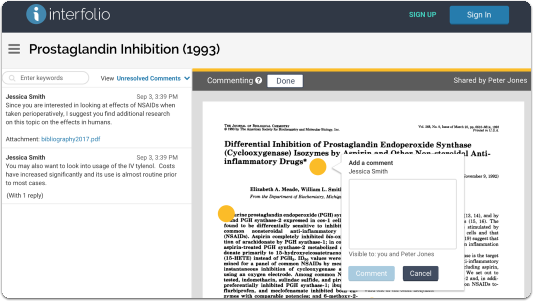 An Interfolio document viewer page will display and allow users to review and comment on the provided materials. 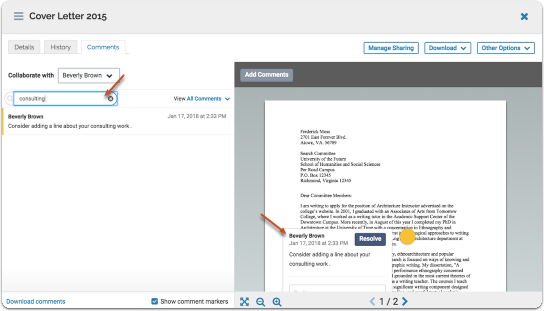 Users will be able to view the document on the right and any comments made will populate on the right and also the location of said comment will display on the document on the right. 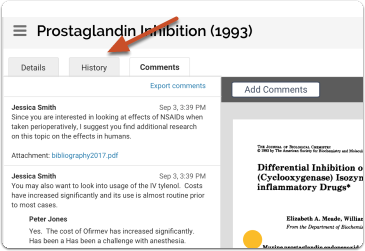 With an active dossier account, reviewers/collaborators can navigate back to this document easily from their Dossier Materials page. 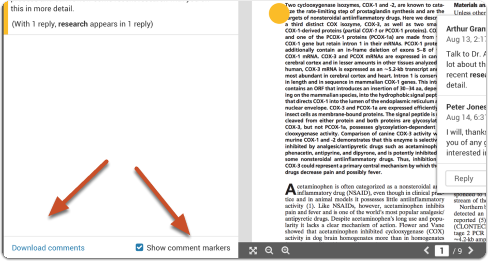 Click the Add Comment Button to leave a comment in a specific location on the document. Why can't I comment on the document that was shared with me? The document owner's Dossier account is no longer provided by an Interfolio Client Institution. The account of either user's Dossier account is no longer provided by an Interfolio Client Institution. The document owner's account is no longer a Dossier Deliver account due to it's expiration. Prev: Why is the shared document "read-only"?